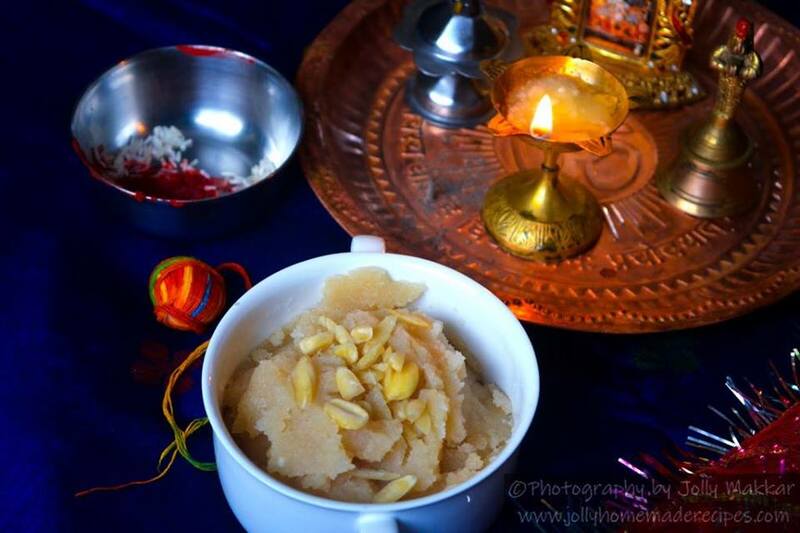 How to make Sooji Halwa (Ashtami Prasad) - It is a traditional Indian slow cooked semolina pudding that made in with few ingredients which is easily available in our kitchen or indian stores. 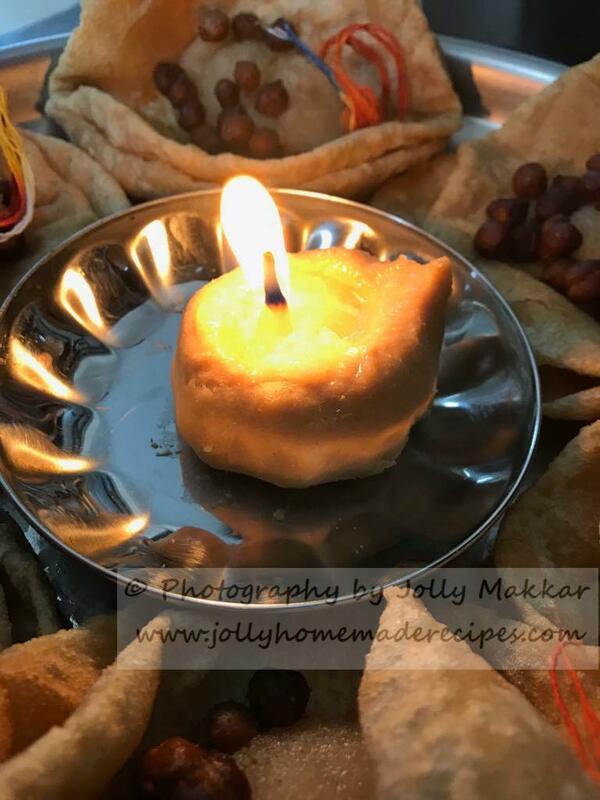 Sooji halwa is often made for an auspicious occasion or a pooja, it could also be a festive occasion like Navratre, Ganesha chaturthi or a religious ceremony conducted in your home or you just want to have something sweet. 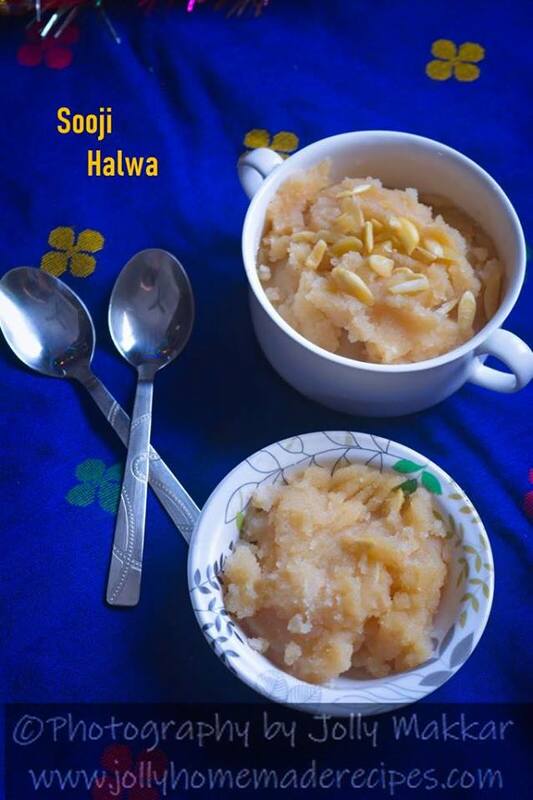 Sooji halwa is very popular dessert throughout India. 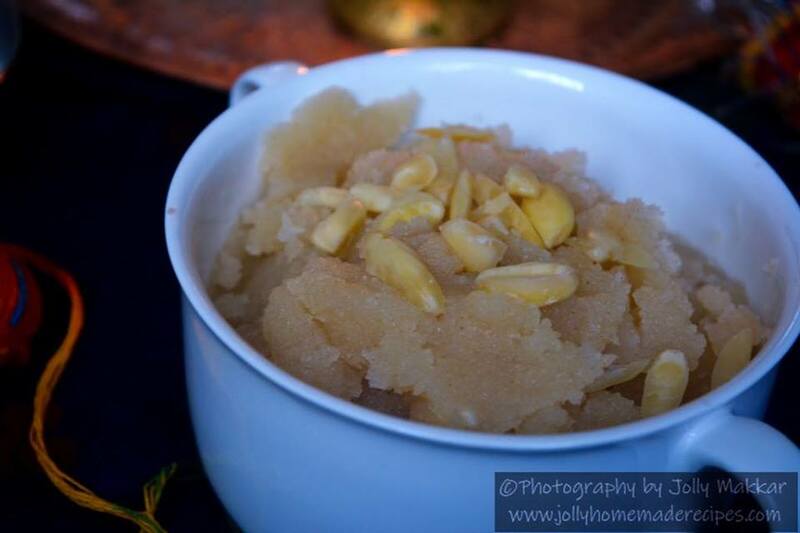 It is called by different names across India – Sooji Halwa in North, Rava kesari in South India and Rava Sheera in West India.. Although the names are different, but the cooking technique is quite similar. Sooji or Rava is the main ingredient in this halwa, there are many variations also like we used water to make halwa & people also used milk instead of water. 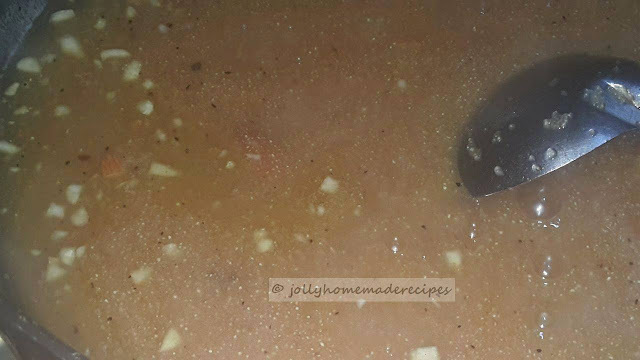 I made sooji halwa in both ways with cardamom flavor or without cardamom flavor..but for this recipe I used cardamom for flavor but my mom didn't used cardamom in halwa, so there are many things are differ but making of halwa is almost same. 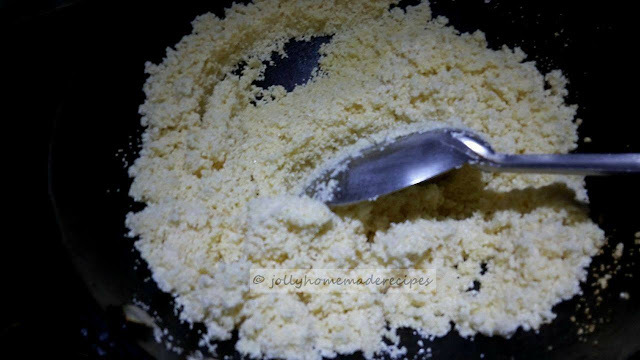 This is one of my family's favourite sweet dish. 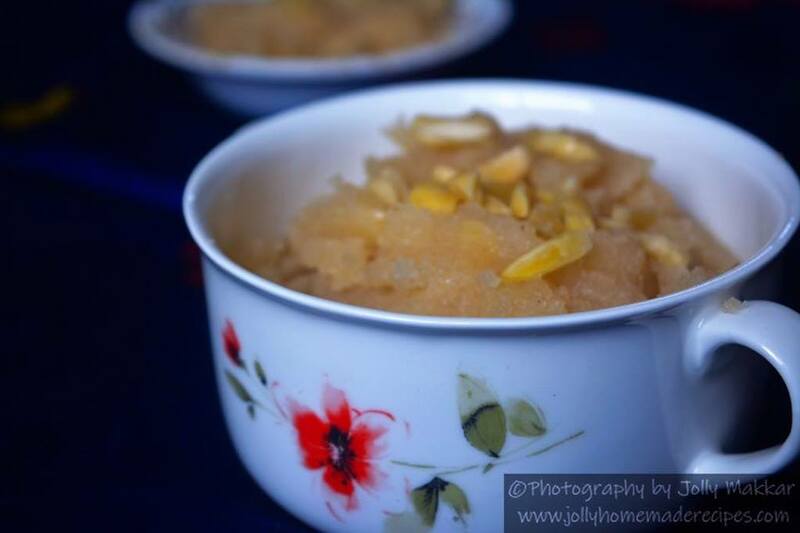 This is my Mom's recipe and nobody makes this yummy Sooji ka halwa like my mom. It is very easy to make. 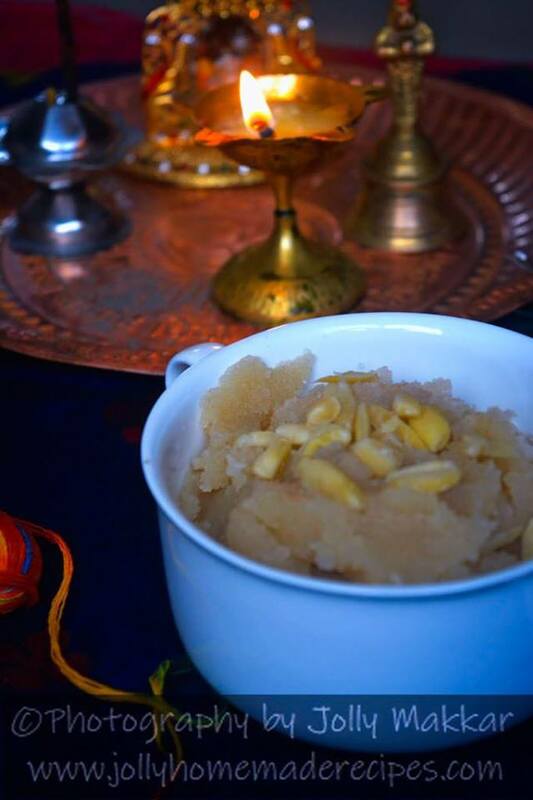 This sweet is a traditional dessert made from sooji (rawa / semolina), cooked in a ghee with sugar syrup and other dry fruits. This is perfect combination with Pooris and Parathas. About Navratri - This is important festival of Hindus, celebrated with lot of enthusiasm and excitement all across the country. It's a "Nine Days Festival" and it is dedicated to nine forms of Goddess Shakti. During the festival of Navratri, Goddess Durga is worshiped in nine avatars. Each goddess has a different form and a special significance. Nava Durga, if worshiped with religious fervor during Navaratri, it is believed, lift the divine spirit in us and fill us with renewed happiness. After 7 days we do Ashtami Pooja on 8th day which is called Kanjak Pooja. It means young girls below the age of 10 and ceremonially worshiped. Some people celebrated this pooja either on Ashtami (the 8th day) or on Navami (the 9th day) of Navratri. We do Ashtami Pooja. On Ashtami, we prepare a prasad and offer to small girls. Ashtami prasad consist of Sooji halwa, dried kala chana and poori or some people offer coconut slices too. It's totally depend on the family traditions. What we do in this Kanjak Pujan! * We welcome young girls in our house and wash their little feet. * Apply kumkum on their forehead and tie a roli on their right hands. * We give gifts in form of money or toys or bangles. * Lastly touch their feet and seek their blessings. Note* : You can adjust the dry fruits or sugar as per as your taste. 2. 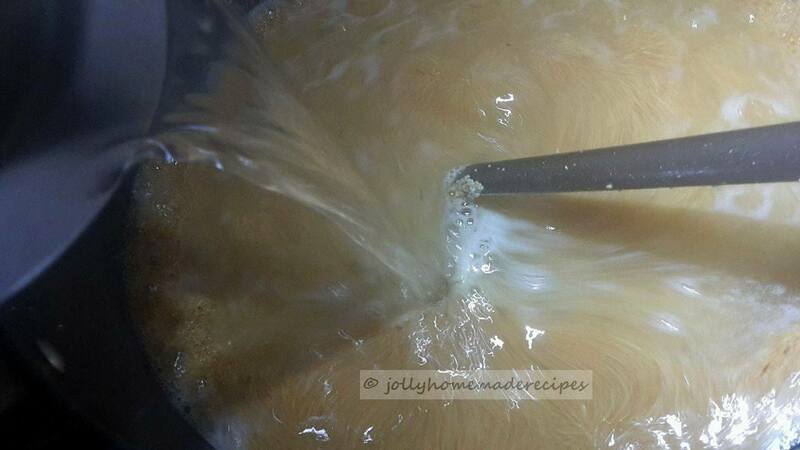 Cook sooji until it is light brown in color, stirring continuously. It take nearly 8 to 10 minutes. 3. Combine sugar and water in a pan. 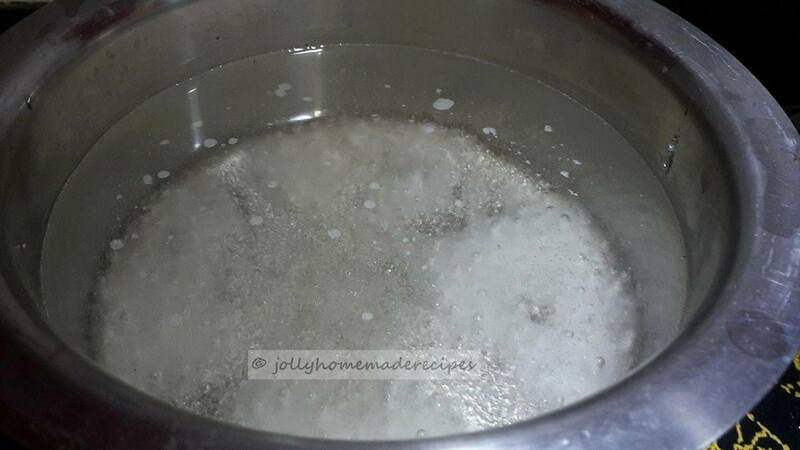 Bring it to a boil and Keep stirring until sugar is fully dissolved in water. Set it aside. 5. Add the sugar syrup in a roasted sooji & constantly stirring slowly by using your another hand...make sure that no lumps are formed. 6. Add the soaked raisins and chopped almonds...keep stirring for a minutes in a medium flame till the whole mixture starts thickening and starts to leave the edge of the kadai or pan. Always maintain the heat at at medium low and keep stirring. 7. Switch off the flame. Your Sooji Halwa is ready to serve. 8. Garnish with chopped nuts, i used chopped badam /almonds, Serve it with Poori or Paratha also or plain after meal. Beautifully explained and loved the recipe too. I adore Sooji Halwa and the kala chana. I have North Indian neighbours who send me this with pooris every year and it really feels special. 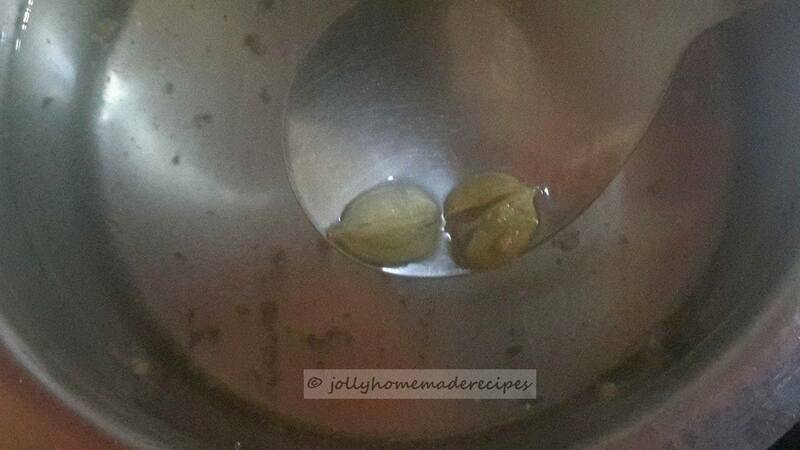 The sooji halwa somehow tastes really different when made for pooja, filled with Ma's blessings! 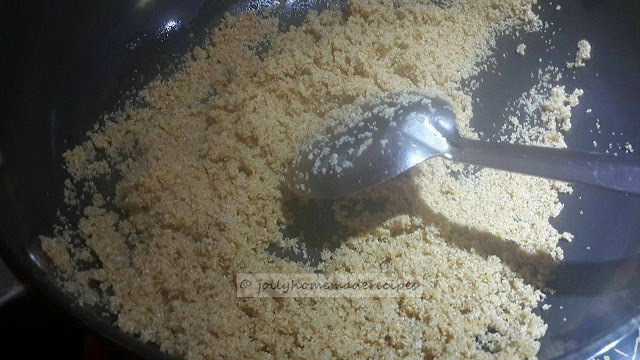 I like sooji ka halwa. 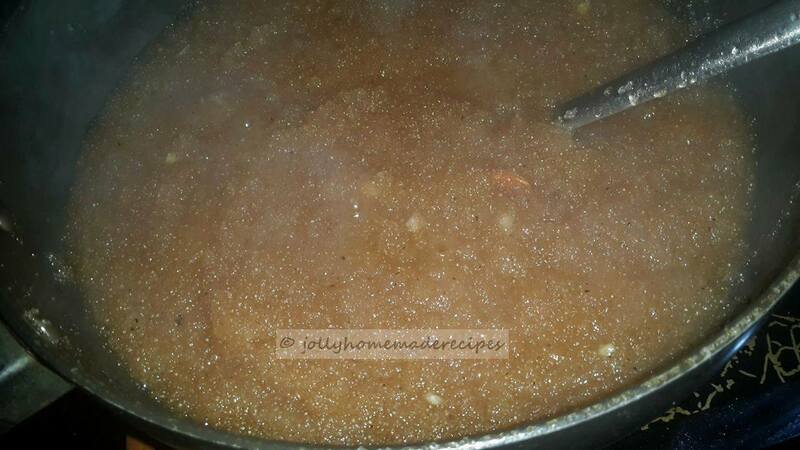 This halwa can be made easily any time.